The world’s oceans, seas and coastal areas are the largest ecosystems on the planet and a precious part of our natural heritage. The ocean economy is estimated to be worth US$24 trillion and as investors and policy-makers increasingly turn to the ocean for new opportunities and resources, this economy has been forecasted to double in size between 2010 and 2030. However, the risks of losses in natural capital resulting from unsustainable activities are continuing to erode the resource base on which such growth depends. We need to raise the bar on our collective ambitions — in government, civil society, and the private sector to ensure that economic activities in our seas are sustainable. A sustainable blue economy fits within the boundaries of our ocean’s ecosystems. Truly integrated maritime policies, adequate economic and legislative incentives, supportive public and private financial and investment flows, as well as successful implementation of ecosystem-based Marine Spatial Planning are all important means to help us get there. Healthy ecosystems, well-managed Marine Protected Areas and good environmental status must be the basis for sustainable development, not separated from it. According to a 2018 assessment by the European Commission, the EU’s blue economy generates over €566 billion and employs nearly 3.5 million people. However, with all EU waters currently failing to achieve good environmental status for assessed fish stocks, paired with a 40% decline in global marine life over the last 40 years, we cannot continue to operate under the guise that the ocean is so vast that human activity cannot affect it. The WWF works with the EU to ensure that the blue economy’s growth is tied to sustainable economies on both land and at sea – that is, an economy that restores, protects and maintains diverse, productive and resilient ecosystems, and that is based on clean technologies, renewable energy, and circular material flows. Our ocean's key assets are worth at least USD $24 trillion. 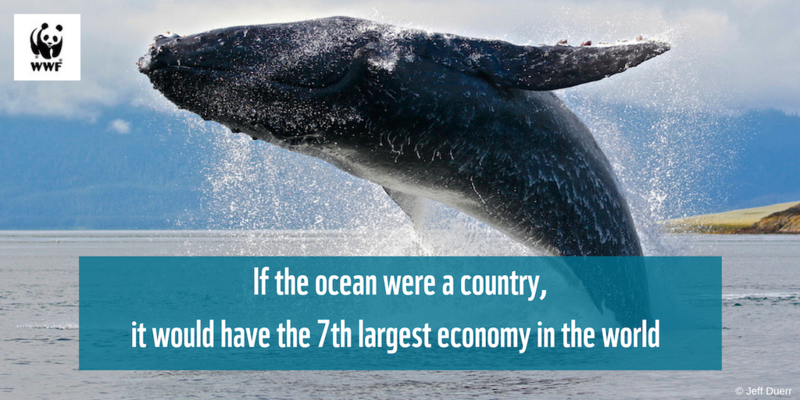 If the ocean were a country, it would have the world’s 7th largest economy. More than 2/3 of the annual economic value of the ocean comes from assets that depend on ocean health. Global fisheries, mangroves, seagrass and coral reefs alone are worth USD $6.9 trillion. WWF has estimated that between 2010-2030, Baltic Sea ships and cargo managed by ports would double, while the number of wind farms could quadruple. In 2016, coastal tourism accounted for 61% of jobs and 42% of the profits of the total EU blue economy.